Meet a very happy, focused and determined 2-year-old named Lucas. He loves to move and is constantly crawling, climbing the stairs and anything else he can find. Fond of being outdoors, Lucas enjoys riding the ATV and lawnmower with his dad. Even more, he likes cutting the grass and being in the dirt. Lucas plays with LEGO for hours with his cousins using the standing frame he recently received from Variety. He loves the challenge of making the pieces fit. Lucas was born premature, spending the first three months of his life in the Surrey Memorial NICU. After his discharge, Lucas and his family met with his pediatrician, physiotherapist and childhood development assistant regularly. Lucas is behind in some growth areas, specifically his gross motor skills. He struggles with low muscle tone throughout his body but maintains his happy demeanour and has been making strides in his development. Lucas lives in Langley with his parents and sister, along with two sets of uncles and aunties and three cousins. He has a wonderful family with tons of support from grandparents and relatives. He has achieved a lot in his life! First Lucas learned to breathe on his own at 2 months. Another milestone was crawling at almost 2 years. Now, he is able to stand up for a couple minutes on his own. 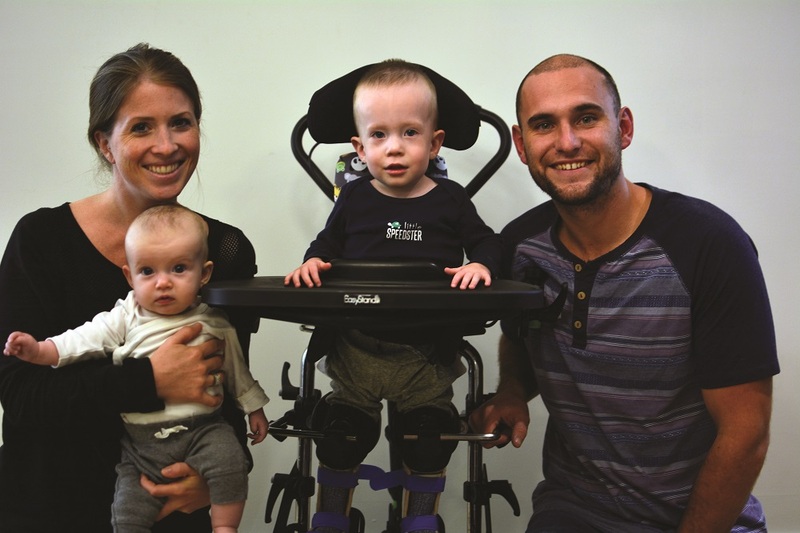 His parents attribute much of his incredible strength gain in recent months to his physio at the Center for Child Development and the Zing Easy Stand standing frame. Thanks to our donors, Lucas received this standing frame funded by Variety. The frame supports Lucas in a standing position and forces him to put pressure on his hips and legs. Keeping him upright, this equipment ensures proper development and helps guide his growth. Not only does the frame promote muscle development, but it also has benefits for digestion, circulation, alignment, cognition and respiration. It also positions him so he can interact with the world around him and encourages his social development. He gets to spend time playing while standing just as he sees his cousins doing. In his frame, Lucas focuses on activities like LEGO, colouring, and eating. These all help develop his fine motor skills as he cultivates the strength to stand on his own. His progress has been distinct and he can stand on his unassisted only a few months after receiving the frame. Luke’s next goals are to walk and run with his friends and cousins, you can do it, Lucas! “It is unexpected to be put in a position where you need extra help to assist your child medically, or developmentally. To have our first child Lucas in the hospital for 3 months and then to watch him be so far behind other children his age was definitely completely unexpected for us. Even though it was a different experience than we expected we would not change a thing about our son or the journey we have had with him. It has become integral to our story as a family and our story as parents. We have learned so much about ourselves through this experience and have grown so much stronger as a family. To the people who donate to Variety, we would like to say thank you. Thank you for your compassion, empathy and generosity to people you may well never meet, or whose stories you may well never hear. This is a charity that changes the lives of many of our children who will one day grow up to do great things and have amazing stories of their own. Many of these children would not have the opportunities afforded to them without the generosity of people like you. We are truly humbled and blessed to have been the recipients of your generosity and on behalf of our family and all the families you help, we would just like to thank you from the bottom of our hearts.